One minute, twins Scarlett and Sam are bickering about who s going to read the Four Questions at the Passover seder. The next minute, they ve been swept up by Grandma Mina s time-traveling carpet and dumped in the ancient Egyptian desert! And as if being stranded 3,000 years in the past isn t bad enough, they also find their fellow Hebrews suffering in slavery. So they team up with Moses, Aaron, and Miriam to help free the slaves. The future s looking bright! But the story they know so well doesn t turn out the way they expected . 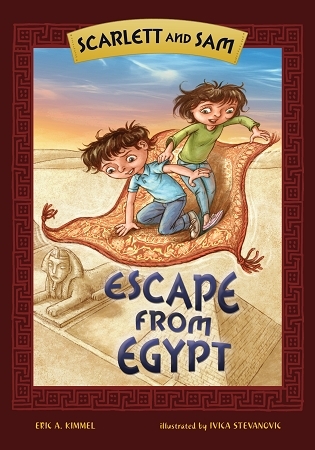 . .
"Magical realism and Jewish history merge in this exciting adventure in which twins Scarlett and Sam travel back in time to Egypt to help Moses convince Pharaoh to free the slaves. Simple language makes it easy for kids to absorb the story, and the two unique main characters deliver witty remarks. Energy, suspense, and Jewish scholarship sweep Scarlett and Sam off their feet, literally, and into a world of peril and delight. Ages seven and up." "a Passover-themed book that seems to be the first to fill a much-needed niche in Jewish children's literature." "Kimmel keeps the story flowing at a rapid pace, employing 21st-century tone and syntax for the twins as well as the ancients with whom they interact . . . it's accessible for modern young readers of all religions and makes it possible for them to gain a modicum of understanding of this distant, biblical past."